To register for our shows, please click on the respective show to take you to the registration form. At the registration form you can see the booth prices for each show. Please read this entire page before proceeding to the registration forms, it contains the rules of Oddmall and other important vendor information. Booth and table pricing information can be found by clicking on the actual show link. Book a 2019 show in 2018 and Save $20! Please read this entire page before proceeding to the registration forms. Click the banner above to apply. 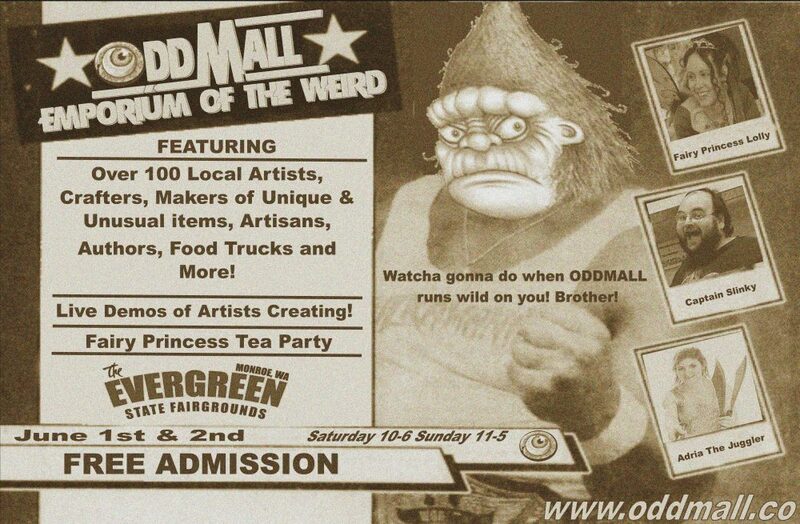 Oddmall is a juried show. This means vendors must pass a very simple screening process to ensure their products meet the quality standards of the show and they aren’t presenting the same products as a dozen other vendors. If you don’t pass the jurying process for whatever reason I’ll refund your booth fee with 24 hours and let you know why. We’ll still be friends. To reserve your vendor space please fill out the forms by clicking the links below. We use a secure PayPal connection for payment(you do not have to have a PayPal account to use this method). We are offering a payment plan for any of the above booths. Here are the guidelines. 1. ALL Payments must be made on time. If you are late by more than 5 days, you will lose your deposit and any previously made payments. We will allow 1 courtesy extension of 10 days, provided you request the extension before your payment is due. 2. Once you apply for the Payment plan, you will receive 3 invoices. The first invoice is your deposit. It will be $65 for a standard booth and $100 for a premium booth and it will be due at signup. The Second invoice will be for 1/2 of your balance (After Deposit) and it will be due within 30 days of signup. The Third and final invoice will be for the final 1/2 (After Deposit) and it will be due within 60 days of signup. All Booth extras (Tables/Chairs/Hotel Rooms/ T shirts) are due with the deposit. Most booths at Oddmall are either 18″ x 6′ Table spot (chair sits next to table, storage underneath) 8′ wide and 6′ deep, 8′ x 8′ or 10 ‘ x 10′. We have a limited amount of 12′ x 6′ and 16′ x 8′ premium booths (Booths availability depends on show location). Certain booths may have variations of + or – 6 inches wide to accommodate fire code and room outcroppings. We do our best to get as close to advertised sizes as possible. Electricity for your booth is included free on a as available limited basis. (if you can reach an outlet, you can use it. All extension cords must be taped down for safety.) We recommend an extension cord of 25′ to reach the nearest outlet. Wireless internet access is included at no extra charge. 8′ Tables and chairs are available at signup for an additional fee. Oddmall is open rain or shine. The show will go on. If you need to cancel your booth, you must do so in writing via email. Oddmall booth fees are nonrefundable. They are, however, transferable to the next Oddmall show if you notify David at oddmallseattle@gmail.com at least 30 days before the show. Any cancellations within 30 days of the show are non-transferable and non-refundable. Hotel Rooms and extras (Tables, Chairs, Shirts, etc..) are non-refundable. Sharing of booths is allowed (encouraged, even) and vendors may purchase more than one booth each. You must have a Washington Business License to sell at Oddmall. The State of Washington requires that anyone engaging in commerce at our event either possess a Permanent Business License or a Temporary Business Certificate, which can be obtained free (See below for links). All Vendors are responsible for collecting and reporting the appropriate state sales taxes. Each vendor shall be solely responsible for obtaining any and all applicable licenses under federal, state, or local law applicable to its activities at the show. The vendor shall also obtain any and all necessary tax identification numbers and permits, and be solely responsible for paying all taxes, license fees, usage fees, or other fees, charges, levies, or penalties that become due to any governmental authority. Prior to the Show dates, all vendors are required to obtain a Universal Business Identification (UBI) number, irrespective of whether they are vendors originating from in-state or from out-of-state. UBI stands for Universal Business Identification number. It is the number used to submit sales tax to the state after show. In order to sell in the state of Washington, you must charge and pay taxes to the state. In order to do this, you must get a Washington State Tax Identification number. There are two ways to go about this. The Vendor understands that neither the Organizer nor the Facility will maintain any insurance covering any of the vendor’s property, displays, or merchandise, and it is the vendor’s sole responsibility to obtain such insurance in amount large enough to cover the combined value of all of the Vendor’s property, displays, and merchandise. The Organizer, the facility and its personnel are not responsible for damaged, lost, or stolen items. Vendors are encouraged to decorate their booths in whatever fashion they desire. Backdrops and hanging walls are permitted. You may bring additional tables and fixtures with you, if you like, but all display materials must fit within your allotted space. All vendors are asked to share our posts on all social media. It helps promote the shows which in turn helps bring people in the door, which then puts $$$ in your pockets! All vendors are expected to maintain a professional conduct with Customers, fellow Vendors, Event and Building Staff and Volunteers. Both before, during, and after shows. Conduct deemed unprofessional by Event Management will result in loss of booth (No Refund will be issued) and banishment from future shows. To make sure you’re up to date on all of Oddmall’s happenings – such as important announcements, contests and giveaways, and more – make sure to follow us on Facebook and our official Facebook event page at the above link. We’ll do our best to make sure you get the booth you reserve, but Oddmall reserves the right to adjust booth assignments based on availability and unforeseen changes in room layout. Due to the topography and geometry of the various rooms, objects such as pillars and scrunched up accordion walls make it difficult to accurately depict the precise room layouts. The maps represent approximations of the actual layout and no claim of absolute accuracy is made. Please include a first and second choice of booth numbers. Oddmall reserves the right to re-schedule any show. Refunds will not be given for re-scheduled shows. Billing statements will say “Oddmall Seattle” as the account name. We do have Color street.